Carosso, Serena Liu, Rui Miller, Patricia A. Hecker, Scott J. Glinka, Tomasz and Miller, Marvin J. 2017. Methodology for Monobactam Diversification: Syntheses and Studies of 4-Thiomethyl Substituted β-Lactams with Activity against Gram-Negative Bacteria, Including Carbapenemase Producing Acinetobacter baumannii. Journal of Medicinal Chemistry, Vol. 60, Issue. 21, p. 8933. Metan, Gökhan Ilbay, Ahmet Eser, Ozgen Koseoglu Unal, Serhat and Zarakolu, Pinar 2017. A Silent Epidemic of Colistin- and Carbapenem-Resistant Enterobacteriaceae at a Turkish University Hospital. Infection Control & Hospital Epidemiology, Vol. 38, Issue. 02, p. 254. Kumar, Mohit Saha, Sandipan and Subudhi, Enketeswara 2016. 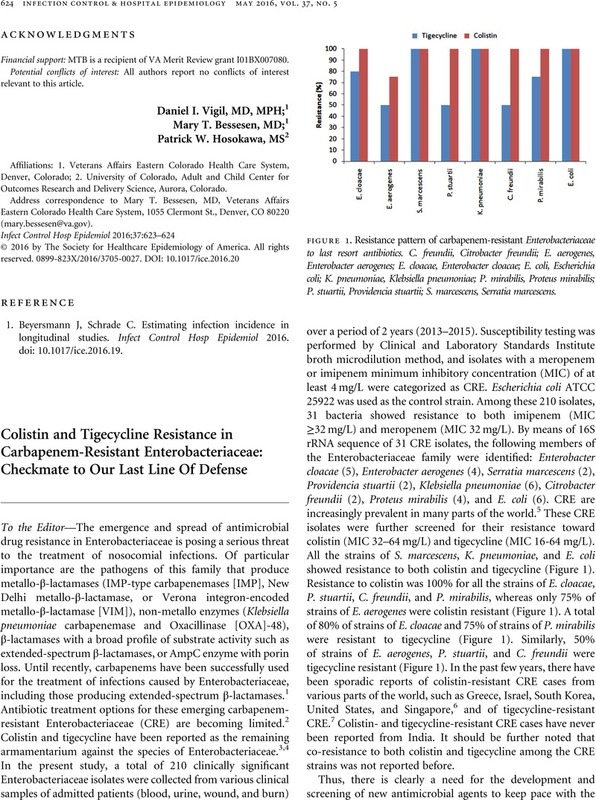 More Furious Than Ever:Escherichia coli-Acquired Co-resistance Toward Colistin and Carbapenems. Clinical Infectious Diseases, p. ciw508. Metan, Gökhan and Akova, Murat 2016. Reducing the impact of carbapenem-resistant Enterobacteriaceae on vulnerable patient groups. Current Opinion in Infectious Diseases, Vol. 29, Issue. 6, p. 555. Perez, Leandro Reus Rodrigues 2016. The Impact of Carbapenem-Resistant Enterobacteriaceae Type on Clinical Outcomes After the Recovery of This Organism From Urine of Critically Ill Patients. Infection Control & Hospital Epidemiology, Vol. 37, Issue. 10, p. 1257. Biotechnology and Bioinformatics, NIIT University, Neemrana, Rajasthan, India. Address correspondence to Mohit Kumar, PhD, Biotechnology and Bioinformatics, NIIT University, Neemrana, Rajasthan-301705, India (kumarmohit@yahoo.com). 1. Falagas, ME, Lourida, P, Poulikakos, P, Rafailidisa, PI, Tansarli, GS. Antibiotic treatment of infections due to carbapenem-resistant Enterobacteriaceae: systematic evaluation of the available evidence. Antimicrob Agents Chemother 2014;58:654–663. 2. Kelesidis, T, Karageorgopoulos, DE, Kelesidis, I, Falagas, ME. Tigecycline for the treatment of multidrug-resistant Enterobacteriaceae: a systematic review of the evidence from microbiological and clinical studies. J Antimicrob Chemother 2008;62:895–904. 3. Biswas, S, Brunel, JM, Dubus, JC, Reynaud-Gaubert, M, Rolain, JM. Colistin: an update on the antibiotic of the 21st century. Expert Rev Anti Infect Ther 2012;10:917–934. 4. Sader, HS, Castanheira, M, Flamm, RK, Mendes, RE, Farrell, DJ, Jones, RN. Tigecycline activity tested against carbapenem-resistant Enterobacteriaceae from 18 European nations: results from the SENTRY antimicrobial surveillance program (2010–2013). Diagn Microbiol Infect Dis 2015;83:183–186. 5. Livermore, DM, Warner, M, Mushtaq, S, Doumith, M, Zhang, J, Woodford, N. What remains against carbapenem-resistant Enterobacteriaceae? Evaluation of chloramphenicol, ciprofloxacin, colistin, fosfomycin, minocycline, nitrofurantoin, temocillin and tigecycline. Int J Antimicrob Agents 2011;37:415–419. 6. Marchaim, D, Chopra, T, Pogue, JM, et al. Outbreak of colistin-resistant, carbapenem-resistant Klebsiella pneumoniae in metropolitan Detroit, Michigan. Antimicrob Agents Chemother 2011;55:593–599. 7. Spanu, T, De Angelis, G, Cipriani, M, et al. In vivo emergence of tigecycline resistance in multidrug-resistant Klebsiella pneumoniae and Escherichia coli . Antimicrob Agents Chemother 2012;56:4516–4518.